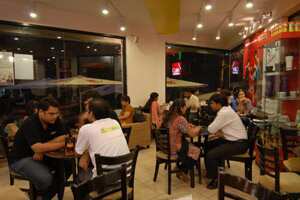 Café Coffee Day. Photo by Hemant Mishra/Mint. Mumbai: Leading coffee chain, Cafe Coffee Day, is planning to add 900 more outlets spanning 330 towns in the next three years. “There is no saturation in big cities. But, we are also looking at other cities. We are present in 170 towns now, and in the next three years we should be present in 500 towns, adding 900 new outlets," Cafe Coffee Day marketing president K Ramakrishnan told PTI. Ramakrishnan said that launch of lounge, the latest format, was in response to the customer demand. “Most of our customers have been associated with us from their teenage days, and as they grew up they felt the need to have something sophisticated and hence the lounge format was introduced." The firm operates 20 CCD lounges, which will go up to 100 in the next two years, he said. However, he did not divulge investment, revenue or profitability details. There are 1,600 cafe chains in the organised space. With 1,100 outlets CCD is the largest, and it competes with the Luigi Lavazza-run Barista Lavazza chain, and Whitbread-operated Costa Coffee. When asked how the company will safeguard its share in the segment with the iconic Starbucks planning to enter India, Ramakrishnan said, “There is enough room for many more." “The current per capita coffee intake is just 82 gm in the country, while it is 4 kg in the US. There are 5,000 towns in the country and the entire cafe industry put together is present only in 180 towns," he said. Asked if CCD will increase prices due to increasing commodity prices, he said, “Commodity prices don’t impact us that much as all our coffees are self-sourced. However, there is food, milk and sugar that we also use. Typically we increase our prices once a year, but if it is unbearable, then we will be forced to pass it on to the customers." The company had increased the prices in April.